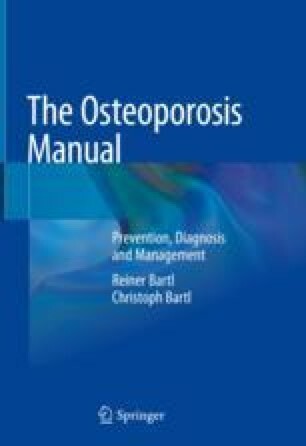 In osteoporotic patients, a minor trauma may cause extensive injury to bone with displacement, haemorrhage and clot formation; or it may affect only a small number of trabeculae without spectacular displacement or pain. Minute breaks or cracks (“microfractures”) occur chiefly in weight-bearing bones, especially the vertebrae, usually after marked bone loss as in osteoporosis. Sometimes only a single trabecula is involved, as demonstrated in bone biopsies. However, in iliac crest biopsies, recognition of cracks may be difficult. It should be mentioned that these cracks are the result of the daily “wear and tear” as the body gets older and not of a specific external trauma or a fall. Major fractures are always accompanied by bleeding, and subsequent organisation of the clot is an integral part of the unique and highly complex healing process (Fig. 30.1). The bone, bone marrow, periosteum, surrounding muscles, nerves and blood vessels each contribute to the healing process. Fracture healing represents a repetition of the embryonic ossification process. Therefore, the bone is an exception compared to all other organs, as it does not produce scar tissue but regenerates mature bone tissue independent of the bone turnover rate.